The 34.38 metre motor yacht True North, listed for sale by Crom Littlejohn at Northrop & Johnson, is sold with Andrew Cilla at Luke Brown Yachts introducing the buyer. Built in GRP by US yard Westport to a design by Jack Sarin, True North was delivered in 2006 as one of the yard’s Westport 112 models and refitted in 2015. She combines modern styling, responsive performance, and luxurious accommodation for eight guests in four cabins consisting of a large full beam master suite, a VIP suite and two guest cabins, all with full en suite facilities. She differs dramatically from her sisterships in that she features a highly customized Robin Rose interior using cherry wood joinery, custom onyx finishes, and custom soft goods and wall coverings throughout. Her main saloon and dining area are spacious with generous seating and large windows that provide panoramic views. She also has an enormous pilothouse with a 27 inch flat screen television that doubles as a social center with generous seating and panoramic views. 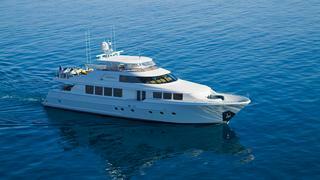 True North is a modern-style raised pilothouse yacht. Her large aft deck and split level flybridge offer a range of al fresco entertaining and dining spaces for guests to enjoy. Her flybridge features a custom hard top, bar, Jacuzzi, lounge seating, and a boat deck for water toys. Twin MTU 12V 2000 M91 engines give her a cruising speed of 24 knots and a range of 2,500 nautical miles at 12 knots. True North was asking $6,450,000.